The Machine of the Year award was one of the highlights at SIMA in Paris. 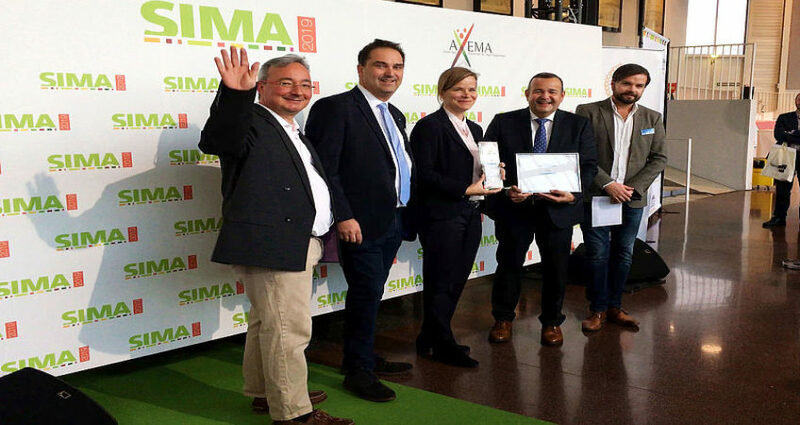 The prize for the best agricultural machinery innovation is awarded in odd-numbered years at SIMA in Paris in February and at Agritechnica in Hanover in November. The jury is represented by over 20 international farm machinery journalists. This year, the new Rubin 10 compact disc harrow was the winner in the tillage category. The jury highlighted the symmetrical arrangement of the discs on both sides of the machine, which prevents lateral draught and ensures significant fuel savings. LEMKEN associate Nicola Lemken, LEMKEN CEO Anthony van der Ley, and Jean-Christophe Regnier, Managing Director of LEMKEN France, accepted the prize in a festive setting in front of over 1,000 spectators from the agricultural machinery sector.